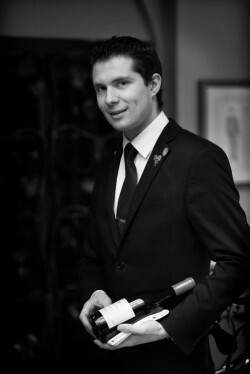 I am working as Head Sommelier at the Vineyard at Stockcross, a 5 Red Star Relais and Chateaux Hotel located just outside of the West Berkshire town of Newbury. The Vineyard is privately owned by the Michael family since 1996, who also own the highly regarded Peter Michael Winery in California. Thus we have big connection with this fantastic wine region. Our wine list contains over 2700 references including approximatly 650 Californian wines and also a selection of over 100 wines available by the glass. The kitchen is headed by Executive Chef Daniel Galmiche and consists of modern French cuisine with a lot of British influences with the use of seasonal, British produce. I had a great lunch in July at Michelin Starred, Texture in London, created by Agnar Sverrisson and Xavier Rousset MS.
A great wine list that I have seen was at a restaurant called “Les Mirabelles” in the New Forest, the wines are as varied as great values! In the 3 Michelin starred restaurant called L’Arnsbourg in Baerenthal, Moselle where I worked before coming to the UK. I like to try different places, although I love to go back to my 1st English place of employment, Hotel du Vin in Winchester. I really love the atmosphere over there and both the food and wines are of a great quality. When I have the time I love to cook! I usually love to cook seafood; I recently perfected a dish of pan fried scallops with some braised chilli mango, beurre noisette, toasted almonds and asparagus. There are plenty of in the UK, I like to go to 28-50 if I go to London, but there are so many that I still need to discover! It is a difficult question to answer, I work with a lot of different suppliers and they all have different specialities…different regions/countries etc so couldn’t pick one. I think that I am lucky to have a very good relationship with them! I drink mainly white wine. I really love dry Rieslings, Gruner Veltliner and dry Tokaji specially when aged. If I go for a red wine, I tend to like them to be full bodied like Priorat or Rhone Valley Syrah. I would almost say everyday brings a new surprise! I have recently tasted a Cloudy Bay Sauvignon Blanc 1996 and it was just incredible! One of the best wines I have ever tried was a Gruner Veltliner Vinothek from the Wachau region in Austria made by Nikolaihof, 1993 vintage at Medlar retstaurant in Chelsea. I was hugely impressed by the complexity and the great freshness of the wine. I discovered Asian wines quiet recently specially a Koshu from Japan which really blew me away when I first tried it. I had the opportunity to taste an English sparkling wine from an estate called Sugrue Pierre in Sussex. The winemaker; Dermot Sugrue, was winemaker for one of the leading English estates, Nyetimber. The wine is priced around £22.00 at cost price and,for me,it can compete with some of the best Champagnes! I dont really drink sparkling wines/Champagnes but I think this one is one of the greatest I ever tried! I did a pairing recently with our Head Chef of Parsley root velouté with a cannelloni of cepes accompanied by a Manzanilla Sherry and thought that the pairing was very good, sadly sherry is a very underestimated wine which normally accompanies food beautifully. Unfortunately, I haven’t had the chance to visit that many wine regions yet, I do have a preference so far for Alsace. I think the landscape there is just magnificent.